In the process of writing the previous two articles, we saw that many of the commodities that had the highest prices also had the lowest volumes, and vice-versa. This begs the question, where are the best opportunities in this industry, where is growth and how do we define it? So in this article we will look at creating an index that combines the two factors and see if it can shed some light on this. One of the most contentious commodities of 2018 was avocados, which saw the biggest drop in average yearly price compared with all other commodities we track. Avocados also saw one of the largest increases in volume of any commodity that we track. 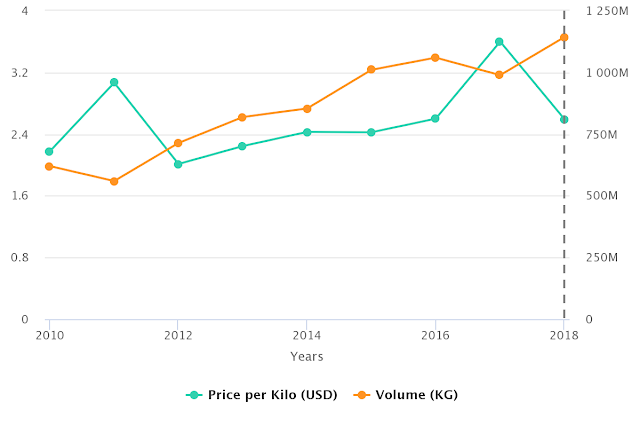 In the graph below we set the average yearly growth of price and volume of avocados against each other to help illustrate what we are seeing in the market. To best represent the evolution of the relationship between these two lines, we need to consider a third parameter – one that takes into consideration both price and volume. The solution is more simple than one might guess, because by simply multiplying the two you get a line that evens out the variance between price and volume – in effect isolating only growth. From there we can calculate percentages in a similar method to what we had done with the prices and the volumes. The table below show what this looks like with the data from the above chart. The data we are using this method is not perfect, but it is the best method I have found with which to understand how markets are growing and compare commodities. Given that shipping point prices exaggerate high prices – mostly because they only capture the spot market which has to respond to deficits left by programs – the values when prices are high will be higher than they should be, but otherwise I believe this method to be representative of category growth. Applying this to our entire dataset, we can then begin to formulate our best of 2018 with a bit more depth. As discussed in the previous article, the data for lemons and oranges are unfortunately distorted by new data that simply wasn’t being reported before. It doesn’t mean that they haven’t seen impressive growth in their own right, but it is hard to compare them to the other commodities. Setting those aside, the top commodities in the industry according to this ranking are limes, avocados and asparagus. These commodities in particular do a very good job demonstrating how growth can be split between price and volume, and looking at both together can be a useful tool to study the long term evolution of a commodity. On the other hand, plums, nectarines and grapefruit all show increases in pricing but have demonstrated the least amount of growth given their decreasing volumes. So this is the best of 2018. I look forward to highlighting some of the most intriguing stories in the market during 2019 and circling around next year to look at how each commodity has grown and evolved in a similar report for 2019. In bold, the commodity “All” represents the average growth for all the products we have in Agronometrics, so commodities above this line should be more attractive than the ones below. To read this chart, keep in mind that 100% equals the same volume as last year, where anything above is growth and anything below is a loss. † Commodity growth is not a figure with which to quantify the value of the market as Shipping Point prices only represent a percentage of the volume being commercialized, it should only be used as an abstract tool with which to look at growth. 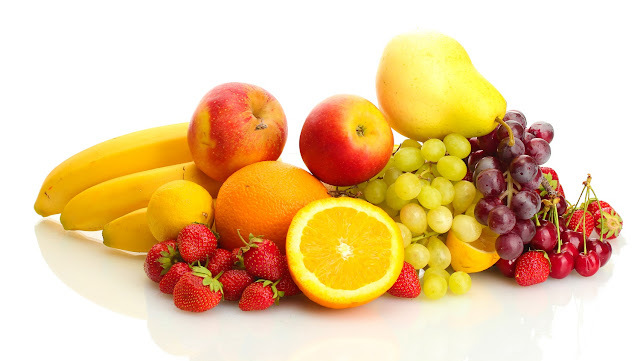 The (*) has been included to next to mark fruit that as of 2018 and partially in 2017 included fruit volumes that were prior to not recorded, which could distort growth statistics. You can see more about this in the previous article The Winners and Losers of 2018 (Part 2 of 3). Here is part two of three looking at the winners and losers of 2018. The previous article was based on pricing information made available by the USDA market data, and here we will look at the volume data. Taking a look at the pear markets, the first thing that struck me when I began researching this dataset is that the market appears to be in decline, which I haven't found to be very common among the different commodities we work with. From the available data it seems that 2015 was pears’ best year, after which volumes began to decrease, dropping by almost one fourth since their high point of 2012. Initially, the drop in volume coincided with increases in pricing, but that trend has since tapered off, seeing both a drop in price and volume over the last two years. This tells me that the demand for pears is waning. At the same, time other fruits are seeing growth, so it appears that consumers are choosing to spend their dollars on other products, which has been eating into pears’ market share within the produce aisle. I don’t have any objective data on what products are taking market share from pears, but any comments or opinions on the subject would be more than welcome.